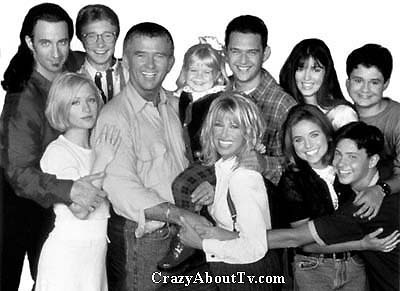 Step By Step was a 30 minute comedy series that aired for its first six seasons on ABC and then for one more on CBS. It was about a single father and a single mother with three kids each who impulsively decided to get married. All of the kids hated the idea but they had little choice but to become a family. They simply took things "Step by Step". Title: "Step By Step Theme"
Written By: "Jesse Frederick And Bennet Salvoy"
The title of the series actually had two meanings. It referred to the fact that recovering from divorce and the break up of families is something that doesn't happen overnight. It's taken "Step-by-Step". It also refers to the fact that the newly formed family consisted of a step-mother, step-father, step-brothers and step-sisters. Cody Lambert left home at the end of the fifth season to travel around the world (and leave the series). The reason for that was that Sasha Mitchell who played Cody was accused of domestic violence. He was eventually cleared of the charges and returned for the last episode of Step-by-Step. You would have to be unconscious to not see the similarities between Step by Step and the 1969-1974 hit classic series, "The Brady Bunch". About the only differences were that on the classic series dad was an architect and mom was a homemaker with a live in maid. On Step-by-Step, dad was a construction worker and mom was a beautician. In any case, the storyline still worked as few series survive for seven seasons! Jean-Luc Rieupeyroux once told Carol that she looked like Chrissy on the series "Three's Company". Suzanne Somers actually did portray Chrissy on that show. In the season four series finale, Carol and Frank were blessed with the birth of a baby girl named Lilly. After just one season as a baby, Lilly suddenly appeared as a five-year-old child! Step by Step was specially created for Patrick Duffy. When he agreed to return to the hit drama series "Dallas" after being killed off in a prior season, he insisted that a clause be put in his contract guaranteeing him a new series after Dallas ended. Step-by-Step is the result of that clause and it premiered the season following the final season of Dallas. When 'Patrick Duffy' agreed to return to Dallas in 1986, he had it put in his contract that he would get to be on another television show after "Dallas" ended. Honoring that agreement, this show was created specifically for Duffy, and it premiered the season after "Dallas" ended. Thank you for visiting our Step By Step page!